Treat your students to the comforting taste of home with this quick-to-fix baked mac and cheese casserole, made with rich and creamy Campbell's Mac & Cheese Reduced Fat Whole Grain Rich, and served with Goldfish® Made with Whole Grain Cheddar. 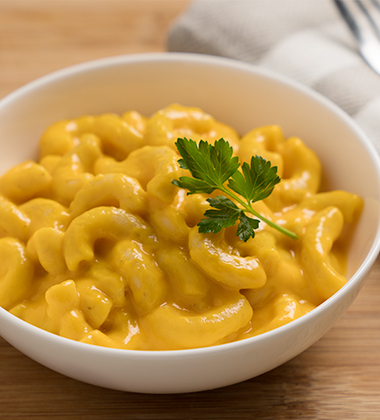 Our new Mac and Cheese tastes delicious and creamy. It’s the perfect choice for operators looking to elevate the mac and cheese eating experience. Serve as purchased, or try one of our savory recipes, as part of a complete reimbursable meal. Perfect for kids restaurant menus, healthcare, and other venues where a great tasting, nutritionally advantaged product is required. a. Spray the pan(s) with cooking spray. b. Pour 3 pouches (5 lb ea) of tempered mac and cheese into each pan. c. Sprinkle 20 oz cheese (about 5 cups) over the mac and cheese product in each pan. Mix to distribute evenly. CCP: Cover pans with foil, and bake in the oven until the cheese on top is melted, the casserole in the center of the pan reaches 165° F for 15 seconds. a. Conventional oven- at 375° F for approximately 1 hour, stirring after 30 minutes. b. Convection oven- at 350° F for approximately 75 minutes, stirring every 30 minutes. CCP: Hold for hot service (covered) at 140° F.
Portion each serving with an 8-oz spoodle or TWO #8 scoops. Serve with a pre-portioned 1-oz. condiment cup (about 16 goldfish) of Pepperidge Farm® Goldfish® Made with Whole Grain Cheddar. Serve immediately.